Directly west of Mexico City, sits the beautiful and exclusive Polanco: Mexico City’s finest neighborhood. Manicured hedges, dazzling shops, lively street performers, and well-dressed locals fill the Polanco neighborhood with a magic unmatched by any other Mexican city. During the day, this Mexico City neighborhood is often bustling, but when the sun goes down, candles are lit to illuminate patio tables and wine fills and refills even the largest of glasses, as all of Polanco’s multicultural locals, clad in upscale clothing, come out to play and relax in the moonlight. The only limit faced when searching for food in Polanco is that of your own palate. Antique mansions that have been converted into fine dining cuisines are in abundance in Polanco, but a few dining locations certainly rise to the top. Pujol, which placed 20th in The World’s 50 Best Restaurants of 2017, offers traditional Mexican recipes that will certainly get your taste buds doing the tango. Ranking 22 in The World’s 50 Best Restaurants of 2017, is Quintonil, which provides a beautiful oasis, both in seating and on the plate. This well-known restaurant provides fresh green recipes and is perfect for both business dining and casual eating. Although Biko did not rank in The World’s 50 Best Restaurants of 2017, it did receive honorary mention on an additional list of 50 restaurants. Meals at Biko are concocted in such a way that customers truly undergo a complete dining experience. Biko visitors are certainly not disappointed after eating a meal, and this restaurant’s solid reputation keeps the locals coming back for more. Polanco itself is a very walkable area. As the neighborhood is regarded as highly safe, locals have no issue walking to and from their home to various shops, restaurants, and other destinations. However, a car may be required if traveling outside of Polanco, but keep in mind that traffic can get very dense, especially during peak hours. Public transportation is available, as the metro runs through tourist areas in Polanco and will take riders to neighboring streets. Other busing options exist and are typically reliable. Bicycles are a popular method of transportation. Bike lines connect Polanco to surrounding neighborhoods and many parks are connected with bike lanes as well. Green space in Polanco is in abundance. Beautifully landscaped parks, exquisitely chiseled statues, and effervescent fountains are commonplace in this neighborhood. 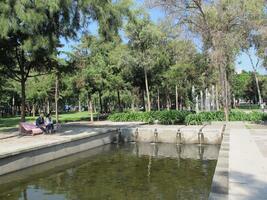 Bosque de Chapultepec, one of the world’s most renowned urban parks, neighbors Polanco. The park boasts museums, a zoo, and even a castle. Activities in the park include paddle boating, kite flying, and site-seeing. Also located within Bosque de Chapultepec is Calzada de los Poetas, an enchanted walkway that honors 10 of Mexico’s most prominent poets and writers. Statues and beautiful flora complete this peaceful walkway, adding to the magic of the park and breathing cultural history, brilliant poetry, and enriched writing into the air. 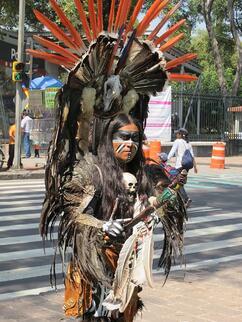 This is certainly a site to visit when staying in Polanco! 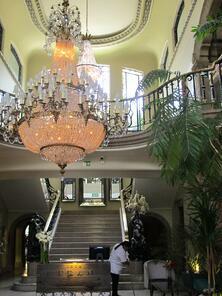 Visiting museums, various parks, and boutique shops are among some of the greatest day activities. At night, eating dinner in a fine dining environment, attending a theater performance, or livin’ la vida loca at the any of the nightclubs should be on the to-do list. 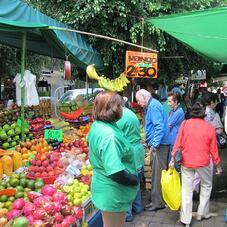 Street markets, or tianguis, set up shop on the street sides of Polanco. Fresh fruit, vegetables, tacos, and a variety of other Mexican snacks are purchased and devoured by hundreds of market goers during business hours. The most visited museum in all of Mexico, Museo Nacional de Antropolgía, (The National Museum of Anthropology), proudly sits in Polanco’s city limits. It hosts the world’s largest collection of Mayan artifacts and draws in curious guests from around the globe. Shopping at Avenida Presidente Masaryk may not be the greatest choice for one’s wallet, but spending time on this retail street makes even the most common individual feel like a VIP or Class A Celebrity. This shopping district holds only the best Mexican brands and helped solidify Polanco as an upmarket area. Teatro Telcel is the neighborhood’s upscale underground theater. Although new, aspects of the theater’s architecture resembles ancient Aztec temples, helping theater-goers feel like a part of Mexican history. Common housing in this district is comprised of mostly apartments. Luxurious balconies, private drives, and gardens don apartment complexes in a wealthy charm that remains unparalleled. These apartments vary in size and age, so rest assured, the appropriate living space is available to any person seeking to make this exclusive city home. Dwellworks offers corporate housing options in Polanco for those who are temporarily relocating to Mexico City for work. Take a peek at our Sofocles and Carso properties if you're looking to visit. Interested in learning more about Mexico? Check out this country's Destination Profile!